Joseph Avski was born in 1980 in Medellín, Colombia. Although he graduated with a degree in Physics, clearly his heart aspired to different matters of the universe. It follows that Joseph Avski wrote a book in Spanish called El corazón del escorpión. He wrote it under his other name: José Manuel Palacios Pérez. It was published in Colombia in 2009. This book went on to win a prestigious award in the city he was born in. Quite the fairy tale. Having said that, his book is far from a fairy tale. Sure, it could’ve shaped up to be a fairy tale, but instead it shapes up to be a lesson, a warning, a story full of the mortality we cannot escape. El corazón del escorpión is an important book, but its audience is limited to people who can read Spanish. Imagine if Pedro Páramo were never translated into English. Such an important book that not only has entertained Spanish and English readers (as well as readers of every other major language), but also influenced key writers. Without translations of Pedro Páramo, the literary landscape would be impoverished, or at least not as bountiful as it is. And the same would be said about El corazón del escorpión if it were never made into Heart of Scorpio. But, thanks to the translator, Mark David McGraw, the literary landscape will never be so impoverished. I think this is something to rejoice about, and I’m sure, after you read Heart of Scorpio, you’ll feel like rejoicing too. Tiny TOE Press is pleased to handpress this important book for English readers. To make it flesh. To make it yours. 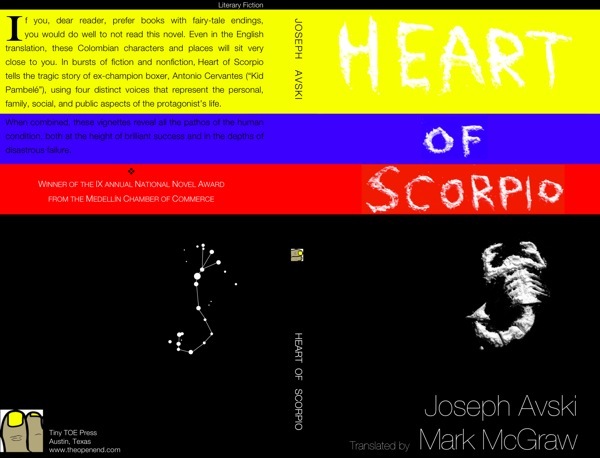 That is, if you reach out and grab it: Heart of Scorpio ((( [wp_cart:HEART OF SCORPIO by Joseph Avski & Mark David McGraw:price:13.00:end] ))).